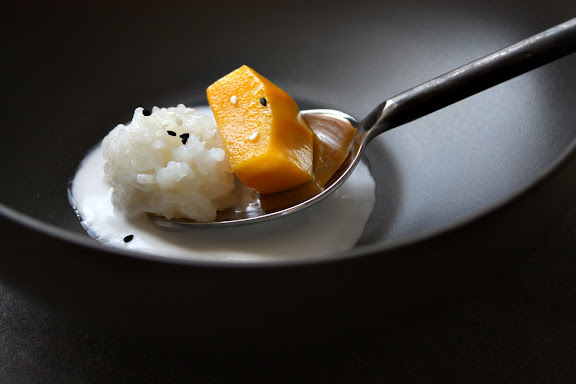 At a risk of causing some raised eyebrows, I am going to say this: if you can produce excellent sweet coconut sticky rice and pair it with a perfectly ripe mango of exceptional quality, the kingdom of heaven is at hand; but if you’re going to fail — even just a little — on one component, may it be the sticky rice. 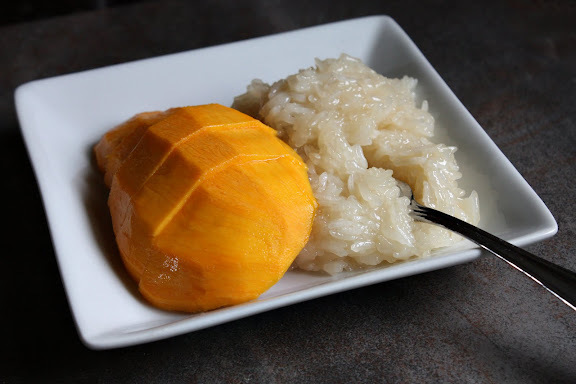 In fact, the coconut sticky rice is made to complement the mango, not the other way around. The rest of the year, this sweet coconut sticky rice is routinely made as a foil for different kinds of sweet and half-sweet-half-savory toppings. However, during the months of April through June when mangoes are at their best in Thailand, the same coconut sticky rice, which usually borders on being taken for granted, all of a sudden shows up all over town with big smiles that cannot be wiped off its sticky face now that it’s paired with mangoes at their peak. It takes some practice to get the sticky rice part right, but when you pair it with the best mango, any shortcomings easily fade away. Tart, unripe, fibrous, tasteless mango, on the other hand, can ruin even the best quality coconut sticky rice. Put the rice in a heatproof bowl and steam in a steamer, over medium heat, for about 20 minutes (based on one half cup of rice). The rice should be cooked through with no hard, raw bits in the middle of the grains. You can also cook the sticky rice without a steamer, using the splatter guard method. Turn off the heat and let the rice stay in the steamer, with the lid on, while you prepare the coconut milk. In a heatproof bowl, heat the coconut milk, sugar, and salt in the microwave on high for 2 minutes. The sugar should completely dissolve and the mixture should be very hot. Take the sticky rice out of the steamer. Pour the hot coconut mixture on top of the rice and gently stir. (It may look like your rice is drowned in coconut water, but the liquid will all be absorbed.) Cover the bowl tightly with plastic wrap and let the mixture stand at room temperature, undisturbed, for half an hour. The coconut sticky rice is to be served at room temperature along with fresh mango. The sesame seeds are optional. The rice can be refrigerated and reheated in the microwave, but the texture of reheated sticky rice isn’t as good as it is when freshly made. Freezing sticky rice is not recommended. As you can see, my favorite ratio for sweet coconut sticky rice is very easy to remember - 1 part raw sticky rice, 1 part coconut milk, 1 part sugar, and one pinch of salt for every half cup of sticky rice. This recipe is for two servings. If you make this for a larger crowd, adjust accordingly. Traditionally, coconut sticky rice is topped with a dollop of coconut cream that has been slightly thickened with rice flour. The topping is made to be a little bit on the salty side in order to bring out the sweetness of the rice. To eliminate one extra step of making the topping, I've made my sweet sticky rice as if it has the topping already mixed in. The texture of the end product is a little softer and wetter than what you would find on the streets of Bangkok, though not nearly as moist as rice pudding. Added June 26th, 2011: I made a batch of the sweet coconut sticky rice with palm sugar several days ago, because I ran out of white sugar. This is not what is normally done in Thailand, and I’d never done it this way before. You need to increase the amount of the sugar a little as palm sugar is not as sweet as white sugar (replace 1/2 cup white sugar in the recipe with 3/4 cup (packed) shaved palm sugar), and eventually — as you can see in the image above — you end up with beige-colored sweet sticky rice which some may consider not as appetizing. But, oh, my goodness, is this good. Added April 16th, 2012: This is a more streamlined, quicker, done-on-the-stovetop clone of Thai sticky rice and mango. Jasmine rice is used in place of the usual sticky rice and cooked in a pot, creating a result that bears more resemblance to western-style rice pudding than the classic Thai dessert. The flavor is the same, though. Pandan creates a more dramatic color contrast and provides the familiar scent of Southeast Asian treats, but you don’t need it. 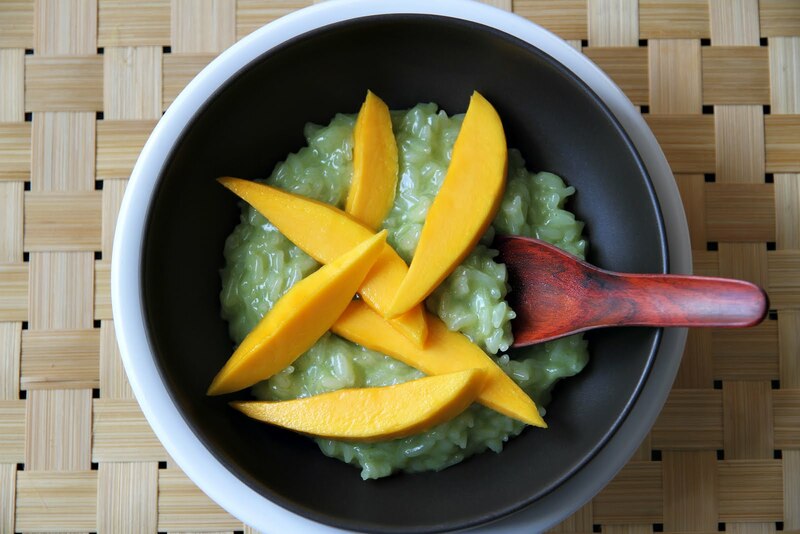 Visit my weekly column on Serious Eats for the recipe: Thai-Inspired Coconut-Pandan Rice Pudding and Mango. Just What Is Thai Sticky Rice? What Kind of Rice Is Thai Sticky Rice? Awesome–thanks for posting this! What kind of steamer do you use to cook the rice? A basket steamer? I always just use my rice pot for rice, so I need to learn new methods! Both can be used to make sticky rice. Hi. I have an award for you! Come by and get it at Cate’s Plate. You know that now in Thailand we are enjoying loads of fresh mangoes daily… ummmm don’t mean to be cruel with you, but you should come back once a year especially to enjoy the summer fruits… mangoes, durians, mangosteen and all. Such a nice series of posts that lead up to this. The closeup of the rice is great — perfectly cooked and glistening. I am always intrigued by new ways to cook rice. It is the one thing that still gives me a little trouble. I have been contemplating getting a rice cooker, but don’t want another appliance in my kitchen. This rice looks like the perfect treat. I just found your blog doing a search for Thai Dipping Sauce and I can’t quit reading! I am going to make this, it’s a favorite of ours and seems easy enough to make. Worried how to steam the rice, but I’ll figure it out. You are on my list now so I look forward to reading. As a newcomer to your blog site I am thrilled to see so many good recipes and tips. And the tribute to your mother is especially heart warming. Thank you so much for the time you put into this blog for the pleasure of so many. Lenka – No need to soak that long, because we don’t want to over-hydrate the rice to the point where it has no room for the coconut milk mixture. If the rice starts off too hydrated, it won’t be able to soak up all the flavor without turning wet and soggy. I’m using Kokuho Rose to make the dessert. But the rice package says one cup of uncooked rice makes 3 cups of cooked rice. It would help if you said what the ratio should be with cooked rice vs. uncooked rice so we can make the proportion after the rice is cooked. That’s my favorite rice. I use the old fashioned Laos method for cooking the rice. I’m going to make this mango rice, I never have but my boyfriends mom has. I love it. ancafe.ninja – Kokuho rose rice is not the type of rice traditionally used to make this. It will be edible; it may even be good in a different way. But that is not the type of rice the Thai people use to make this dessert, and it’s not the type of rice this recipe is written for. With Thai long-grain sticky rice, you end up with approximately 3 times the original amount. This recipe which calls for 1/2 cup of raw rice yields approximately two 3/4 cup servings of the sweet sticky rice. Our local Thai restaurant serves the rice with banana when Mango is out of season. I prefer mango, but something about the banana makes it taste even creamier. It’s worth a shot when you can’t come by a good mango! Kirstin – I’ve got to try that. Thank you! Another fav of mine. I’m curious about the quick soak time for the rice versus usual 6hr+ ? 1973 – The short soak time is intentional. For sticky rice that is steamed to be eaten with main courses — like in most cases — it’s best to soak and steam it longer. In this case, it’s almost like the sticky rice is “cooked” twice. With glutinous rice available in the US being almost always new crop (higher moisture content than old crop), I’ve found that soaking it longer in this case results in mushy grains. Also, remember that the coconut milk-sugar mixture is what gives the rice flavor in this particular dish. You will want the rice to “drink” as much of it as it possibly can without becoming overhydrated (wet and mushy) in the end. So it’s best that you get the steamed rice in a state where it’s still “thirsty” before you add the coconut milk mixture to it. A fully hydrated rice has no room left for more liquid to be absorbed into it grains, and it won’t “drink” as much. And if you force it to drink, it will only turn mushy on you. You are a mad genius. Brilliant. I made this sticky rice tonight. I didn’t want to open a whole can of coconut milk just to use 1/3 of it, so I tripled the recipe. 1.5 cups of each. It came out perfect! Though it may defy all tradition, I even topped it with some of the peanut sauce I made last night. Combined, it was the most delicious food adventure I’ve ever experienced. Thank you. This looks so good! I ate this dessert in Bangkok once and always wished I could replicate it (mainly the sticky rice). Thanks a lot for these tips! I got the right rice and coconut milk, thanks to you! One question about using the coconut milk for this – are you supposed to mix up the coconut cream at the top of the can with the liquid, or just use the liquid? Andre – Glad you’ve found this helpful! I would open the can (don’t shake it beforehand) and try to scoop out the fatty part that rises to the top as possible into the measuring cup. If you get 1/2 cup of the cream, then that’s great; use that. If you end up with less, add the remaining liquid in the can to the cream so you get 1/2 cup total. I’m not sure if you answered this but I live on the Texas border so rice variety isn’t very… available. I’ve had this before and it is SO good, so I was interested if Jasmine rice would yeild this sticky texture? Get back to me, thanks so much! alleybee – Unfortunately, no other type of rice can be used to achieve the same result. None. Not the Japanese sushi rice. Not even jasmine. This type of rice alone will do. However, if you really can’t find Thai sticky rice (have you tried ordering online? ), you may want to give this jasmine rice pudding with mango recipe a try. It’s not even close to the real thing, but good on its own merit. Hi Leela, one question for you. How is it that for this recipe the sticky rice is soaked only for 10 minutes? If I have an old crop do I need to soak longer than this? P.S. I cooked thai sticky rice for the first time to my 5 years old son. He loved it. I’m sure he would really enjoy this. I also need to thank you for your blog. Since I moved here in the South of France, I really miss eating Asian food in general and reading through your blog it’s like travelling. Franci – Yep. From my experience, 10 minutes is enough (20-25 for old crop or sticky rice that has been stored longer than 3 months) as the sticky rice is cooked twice. Well, almost twice — with the steaming and the steeping in hot liquid. The kind of sticky rice you get overseas is so inferior in quality to the kind of sticky rice used in Thailand for this particular application, and it’s more prone to becoming too soggy. really looking forward to trying this recipe out!! can’t decide which version… might start with the easier jasmine rice one and then work my way up. Oh my word this is a fabulous recipe! We are not long back from Phuket and I fell in love with mango with sticky rice. I was desperate to learn how to make it and thanks to your recipe I am in heaven. I will adjust the coconut sauce slightly next time as I found it a little sweet. Also, I absolutely love the ‘splatter guard technique’…ingenious! “Put the rice in a heatproof bowl and steam in a steamer, over medium heat, for about 20 minutes (based on one half cup of rice). The rice should be cooked through with no hard, raw bits in the middle of the grains”. I used the splatterguard method. It took way more than 20 minutes to cook the rice all the way through – maybe about 40 minutes. Then the rice failed to absorb enough of the coconut milk mixture. PS Otherwise, I love your blog! Tom, if you need 40 minutes to cook this amount of sticky rice using the splatterguard method, something is definitely wrong. My guess is that you’re using the wrong kind of rice. Can you tell me what rice you used on both occasions? What does it look like and what’s on the package? So that’s the right type of rice. One puzzle solved. Assuming you’ve followed the recipe exactly, I still can’t think of why it takes 40 minutes + to cook just 1/2 cup of sticky rice when it usually takes me half that time to cook twice or thrice that amount using the same method. Let’s forget the time it takes to prepare the rice for a moment as it may be because you have an extremely old rice that needs to be soaked much longer (if that’s the case, the solution is obvious and easy — though oversoaking and overcooking could lead to another problem which is mushiness). 1. Was the rice cooked? 2. Were the rice warm and the coconut mixture hot (it must be) when you mixed the two together? 3. What exactly did you end up with both times: uncooked or half-cooked rice floating in coconut cream, refusing to absorb anything at all? 1. I was never quite able to get the rice cooked, even after steaming it for ages. There were still a few flecks of white in some of the grains, although most of it was clear. I began to get worried that if I steamed it for too long it wouldn’t be able to absorb the coconut mixture as readily. 2. Yes. The coconut mixture was bubbling after I took it out of the microwave. The rice was still warm from being steamed. Tom, I’ve forwarded this link to a few of my friends to see what they think, and none could figure out what the misstep might be. You seem to be doing everything right. 🙁 Sorry. Thanks for being so thorough in looking into this, Leela! I made this tonight using the microwave to cook the rice, and to my surprise the rice came out nicely, however the coconut milk worried me. The milk was watery and had chunks in it. I thought what the heck I’ll try it any how. Did the mixture for the rice and let it soak. Again I was pleased with the rice. I just wish I would have read this blog before cooking it. My mango was very tart and the left over coconut milk was still watery. I will try this again soon. Until then I guess I’m just going to eat the sticky rice. can this be frozen if you make too much? The sticky rice part can be frozen and reheated. The texture will be somewhat altered and the end result won’t be nearly as good as what it is the day it’s made. But it can be done. The mango part — and I know you were probably just asking about the rice part — should not be frozen. Do you think it is totally out of the question to boil the rice? I made this last night using my last honey mango I brought back from Or Tor Kor market. My god, it was fantastic!!! The splatter guard technics works perfectly for making the sticky rice. I purchased a Thai steaming basket but didn’t use it. The rice was maybe a little bit dry, but maybe I didn’t made enough sauce. My fault I never make measurements when cooking. A question again for your Leela (sorry to bombard you). I need to prepare a full Thai dinner for next week, and want to make this dessert. The asian stores in Paris don’t have very often Thaï Ma muang. I have seen yesterday Vietnamese mangoes. They look green / yellow but will propably turn yellow within 2 or 3 days. Otherwise they have mangoes from Pakistan (looking red, yellow and green). Any recommendation for which variety I should better use for this dish? Arnaud – No idea. The only way to find out is to buy both, ripen them, and taste to see which type works better. I cooked my rice in a regular pot (with a heavy bottom)bringing it to a boil and then putting it on the lowest setting, with the lid on for about 15 minutes. I prepared the coconut milk and sugar, salt mixture while the rice was cooking. I brought the coconut milk to a quick boil and took it off the burner, stirred it well to dissolve the sugar and poured it into the already cooked rice in the pot I cooked it in. Stirred it and put the lid back on. I served it about 10 minutes or more later with chopped mango pieces to serve on top, along with my killer Asian marinated Chicken thighs. *The only thing I would do different is make the rice LESS SWEET. Probably reduce the sugar to 1/4 or 1/3 Cup because it was for a side dish and NOT desert. It was good! As a girl growing up in Sydney, my Thai grandmother would whip up a batch of sticky rice every weekend and bring it round (steamed using bamboo steamer and muslin cloth method). I asked her to show me how to make it, and now every year when mango season starts it brings mouth-watering promise of many mango/sticky rice meals! HEAVEN!!!!!! LOVE your blog, have been inspired to get back in touch with my Thai cooking side again – thanks!! 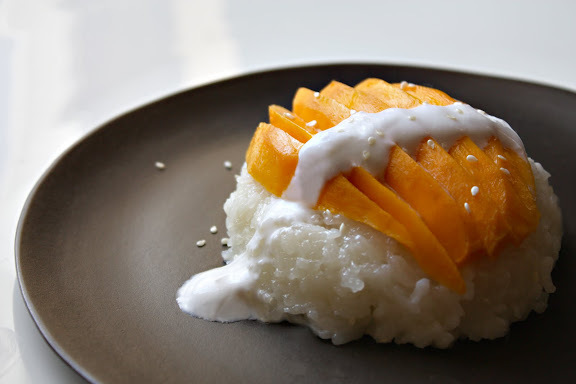 I discovered your wonderful blog recently and being kind of obsessed with sticky rice and mango, i was so happy to have found your recipe and articles about all the ingredients. I am planning on making this dish tomorrow. since the coconut milk is separated in the can, should I homogenize it by beating it a bit before using? or do I just use the thinner part in this dessert? thank you in advance for your reply; I love your blog. Knitspot – Thanks for the kind words! Not a dumb question at all. What you should do is to not stir the separated coconut milk and scoop out not the thin part but the thick, creamy part that rises to the top. That’s the closest thing to what’s traditionally used in Thailand in this dish which is coconut cream, the fattiest, most concentrated first extraction of mature coconut meat. Hi! First of all, I love this recipe and love to make it for crowds–I haven’t met anyone who didn’t love it too. I just discovered a method for steaming the rice without a steamer that made it turn out a lot better. I had a similar problem to what Tom found with the splatter guard method, but I found that putting two steamer baskets (one metal, and one silicon on top of it) into a saucepan and steaming in the silicon basket made cooking the rice a cinch. First of all I didn’t have to worry about picking up a hot, heavy ceramic bowl with one hand to stir the rice as in the splatter guard method. Also, the stacked steamer baskets gave the rice more elevation, so I could keep more water in the steamer without waterlogging the rice, and the handles on it guided the dripping water away from the rice. Additionally, the rice doesn’t stick at all to the silicon steamer basket, and doesn’t fall through the holes, so I didn’t have to lose a good amount of my rice to cheesecloth. Unfortunately, I read only too late that I should be using the coconut cream rather than the milk, but I’ll remember that next time! Thanks for posting such a fabulous recipe! Loved you sticky rice! Cooking method with splash guard was perfect. Since I don’t like my food too sweet, I cut the sugar in half and it was delicious topped with warmed up frozen berries – the tartness of the berries was a great combination with the sweetness of the rice. Your website is fantastic. Tried pad thai today. Had a little trouble with noodles. They took much longer to cook even though I had medium size and soaked for 35 min. I will soak longer next time. Will adjust the sauce a little next time to my taste with more sour less fish/salt. My daughters loved it though and could not wait to sit down and eat.